Discussion in 'Boss 302 and S197 Technical Forum' started by VoodooBoss, Dec 29, 2011. There is a lot of grille information floating around out there so I though I'd compile all the info I have into a concise thread. I've narrowed down my search to the Ford Racing Cobra Jet grille because it's a one piece design and it comes painted white which obviously matches the white striped cars. The info on the CJ grille states it doesn't fit cars with a stock hood but member Nota4re has one mounted on a customers Boss with no issues. Another interesting option is the new TruCarbon carbon fiber one piece grill. It has a very open design and has the potential to flow the most air. I'd add SS wire mesh behind it for additional radiator safety. With our cars running hot on track the obvious solution is to buy a 302S grille but I think a bar style grille like the CJ, TC, Roush style, or Saleen will have better air flow into the radiator. Which grille are you using and why? Anyway here's the links and a couple of photos. I know the S hood isn't an option for everyone, but spending a lot of money on just a grille may not be the answer. Increasing airflow into the hood area requires increased airflow OUT of the hood area as well. This may have already been mentioned, but it’s something to think about. That's the MAIN reason I bought the hood. The fact that it looks awesome is a bonus. I'm banking on the fact that it will resolve the cooling issue. That said, we also know that simply pulling the stock grille drops CHT 20-25 degrees by increasing airflow to the radiator, so a better flowing grille will also improve the cooling issue. My friend swapped to a billet bar grille and dropped ECT (CHT) by 20-25 degrees, similar to what I saw by completely removing the stock grille. 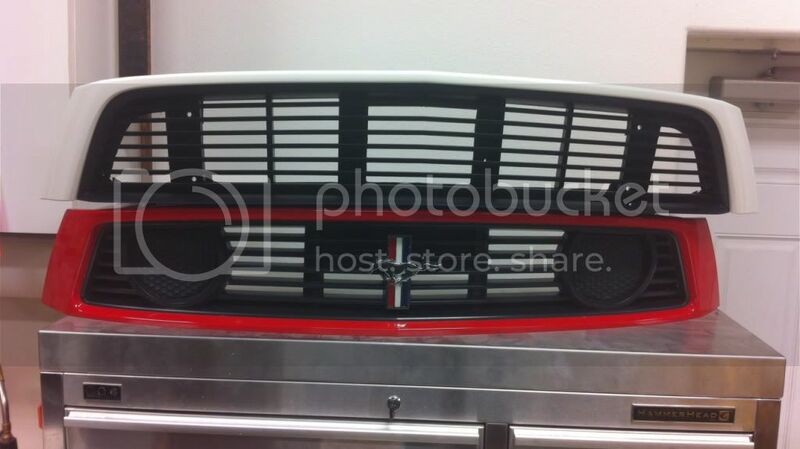 We already know the grille is the main answer and the car doesn't get enough airflow into the radiator. While I'm sure the 302S hood will help with cooling that's not it's main function nor is it advertised as such. After reading others quest through the different grills I like the idea of a one piece grill that can be swapped in and out for track use. For me that eliminates the Roush combo although I like that look the best. I don't like the additional styling of the Saleen grill but it's the least expensive one piece option. The TruCarbon looks interesting but I'd like to see it in person first. I haven't read any first hand experiences with it yet. Come Spring time this will be a hot topic again. Last week I called Ford Racing and asked a guy if he knew if the CJ grille would fit or not. He didn't know one way or another but talked to someone at Ford and then called me back and said the 302R radiator will solve any heating problems. A few have already installed the 302S radiator and that didn't solve the problem but maybe the 302R will. An air to oil cooler also looks like it should help and a couple of options should be available by Spring time. The first place to start though is the grille. GT Surround w/ American Muscle black grille...inexpensive and effective. I only use it at the track because it does not look as nice as the Roush grille. I know the grille is a huge issue. I'm just saying it's not the only issue. Look at my grille compared to the stock ones, it's has almost twice the open area. My point is, how much is opening and swaping grilles going to benefit beyond what others are getting with the S type mod of the grille. Look at this video http://www.youtube.com/watch?v=Gr40fdYmd2I look at the airflow exiting the hood at :20 and :43. Again, I'm not saying that everyone should go get an S hood. I just think there is only so much a grille can do. But I do know someone is going to find out. That's a great video and I hadn't seen that one. Thanks for posting. The hood is supposed to drop lap times up to four seconds a lap on some tracks. I went with the 302S grille with the far left ans right sides also cut out. I like the original look and will give up 1 or 2 CFM by keeping the pony emblem ;D Personally, I'm not a big fan of the full billet look. My assumption is that the differneces between all of these 'high airflow' grills will be minimal. I agree that the vented hood is a logical next step, albeit a big ticket item. Since I only run HPDE's and will start some TT's this season I don't need the additional '4 seconds', she's more than quick enough for me. My next step will be the oil cooler when FRPP makes it available. If for some reason that isn't enough I'll probably choose the 302R radiator as a final step. Although I haven't yet made it to the track (Spring can not come soon enough)... I have been following along this past year as others have uncovered the over heating issue. My current plans are to go with the 302S grill primarily because I want to retain the oem appearance. I doubt I will reach the car's potential this year so I expect that this will suffice for now. I thought maybe Agent 47 would have one out by now. I know it was talked about on TMS a long time ago. Maybe someone in there neighborhood could stop in and find out? I too prefer the OEM look. Is the 302s grill a direct replacement or is there some modification required. If so, what modifications will be needed. Its a bolt in replacement. I just modified the far left and right sides to open it up a little bit more for the air with a dremel tool. I think this is the route that I will be going. Do you have a part number and approximate cost? If you don't have the info handy I'll do some research. A link to the part is in my original post. 302S Grille - Ford Racing Part number M-8200-Mbr, $335.00. Here are a couple of links to emblems. The lower priced one is from a V6 and is not quite identical but try and tell the difference. What about buying another Boss grill, and open it up a bunch, and use it for track days only since the grill pops out easy? 1/2" or so holes in the fog lights, open up the blocked off areas, and maybe remove some of the horizontal bars. Could even put some stainless 1/4" mesh in that Rick included in the first post. What does a standard Boss grill cost? 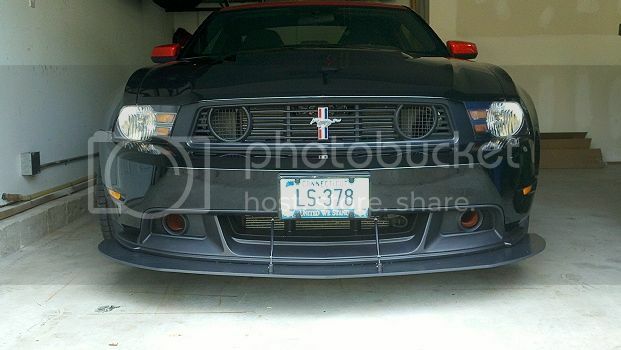 I've got the Saleen grill sitting in an un-opened box in the basement that I bought for the GT but didn't install it. Its very open so should increase airflow, but we lose the Boss look.